Obsessive-Compulsive Disorder (OCD) is an anxiety disorder that causes severe discomfort for sufferers. Persistent, unwanted images, thoughts and images take over, causing a considerable amount of distress. OCD currently affects some three million people in the United States (around 0.3 to 1% of children and 2% of adults). The average of onset of OCD is around six to 15 for males and 20 to 29 for females. Although so many people suffer from OCD, it is estimated that less than 10% actually receive any treatment. Treating a child with OCD is vital and any delay in treatment only causes their health to deteriorate. They could miss out on key aspects of development, paying a price that is totally unnecessary when due diagnosis is made and the appropriate treatment administered. OCD can be very tricky; for some people, symptoms become milder with the passage of time; for others, however, OCD can take over their lives, making it impossible for them to function at work, school, etc. It is therefore vital to seek help before it is too difficult for your child to fight back. Excessive worry (about everything from germs to death). Extreme fears about something bad happening. Feeling that things have to be exactly as the patient believes they should. Having disturbing, unwelcome thoughts or images about hurting others/unwelcome thoughts of a sexual nature. Children may feel strong compulsions to wash or clean, check that all electrical appliances or lights are off, rearranging items until they are “just right,” mental compulsions, repeated apologies, strong superstition, consistently asking for reassurance. Your doctor may deem that your child has OCD if the obsessive thoughts, images and compulsions interfere with their daily quality of life. 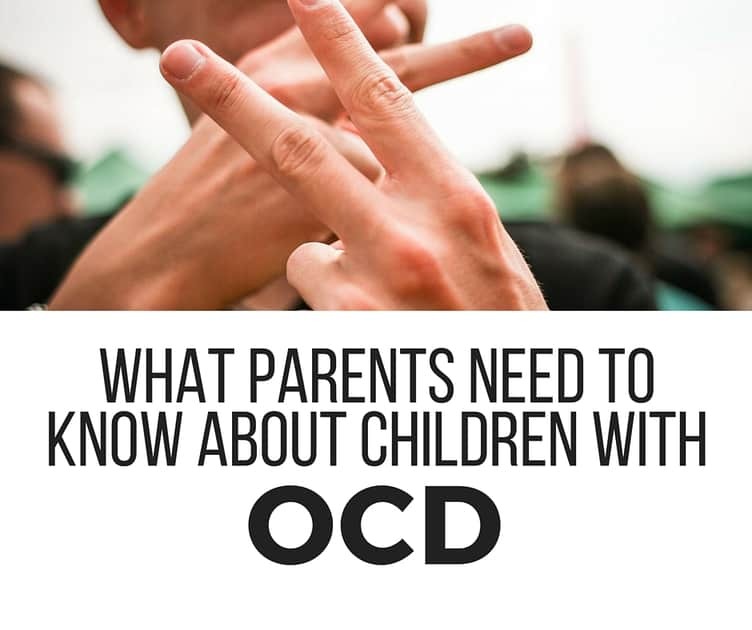 Throughout the process, it is vital to bear in mind that nobody is to blame for OCD; nothing you or your child said or did has caused the condition to arise. It is vital to stay positive and to focus on treatment. OCD does not have a cure, though there are specific therapies which have been found to work well. Take the time to research new methods of treating OCD, to speak to various doctors and recommended specialists, and to find the treatment which best works for your child. Currently, one treatment which has made OCD very treatable is called Exposure and Response Prevention (ERP). As its name suggests, it involves teaching children how to face their fears and triggers, without giving in to compulsions. The treatment must be given by a licensed mental health professional (such as a social worker or therapist), who are trained to help your child understand that it is fine to allow themselves to feel obsessions and anxiety; they key is to master one’s response to common triggers. In severe cases of OCD, or where ERP alone is not proving effective, doctors sometimes recommend medication. Serotonin Reuptake Inhibitors (SRI) have been found to effectively reduce symptoms in children and teens, so that patients are more responsive to ERP treatment. Only a pediatrician or psychiatrist should recommend any medication, ensuring that this line of treatment is necessary and will have measurable positive outcomes for your child. Speak to your doctor about other treatments as well, including day camps, intensive outpatient treatment, etc. OCD can make a child feel intensely isolated, so it is vital that family and friends rally around to support the child. There are various online resources and support groups that will help you realize that far from being an insurmountable obstacle, OCD is a condition that many people have learned to live with, as they learn to overcome their compulsions and begin enjoying a successful, happy life. Psychguides.com, Obsessive-Compulsive Disorder Symptoms, Causes and Effects, accessed February, 2016. Kids.iocdf.org, OCD: What You Need to Know, accessed February, 2016. OCDLA.com, OCD in Children and Adolescents – Symptoms and Treatment, accessed February, 2016. Leonard et al, Childhood Rituals: Normal Development or Obsessive-Compulsive Symptoms?. Journal of the American Academy of Child & Adolescent Psychiatry, 1990, 29 (1): 17-23. Diwadkar et al, Dysfunctional Activation and Brain Network Profiles in Youth with Obsessive-Compulsive Disorder: A Focus on the Dorsal Anterior Cingulate during Working Memory. Frontiers in Human Neuroscience, 2015; 9 DOI: 10.3389/fnhum.2015.00149. CM Gillan et al, Disruption in the Balance Between Goal-Directed Behavior and Habit Learning in Obsessive-Compulsive Disorder. American Journal of Psychiatry, 2011; DOI: 10.1176/appi.ajp.2011.10071062. Baylor.edu, Obsessive-Compulsive Disorder Questionnaire May Give Clues to Other Mental Health Problems, Baylor Study Finds, accessed February, 2016.